Liverpool defender Andy Robertson is confident they can win away to Paris Saint-Germain and secure qualification for the Champions League knockout stages. Defeat in Serbia against Red Star Belgrade means Jurgen Klopp's side have lost their position of strength at the top of Group C and need to win against PSG or at home to Napoli to progress. However, Robertson believes they can get the job done in Paris on November 28. "Of course, we have to," he said. "We believe we can win every game, that's always been the case with us. "We can perform a lot better than the two [away] games we've had [against Napoli and Red Star], they've been off days and we need to look at that, of course we do. "Away from home last season we were very good in the Champions League. This season we've found that a bit difficult. "We're still to play the best team away and we need to go there and put in a much better performance than we have done. "We knew this group was going to be tough and it's proving that way. It's tight and it'll go right to the wire. "We're still confident we'll get through but we need to go to try and prove that now." We need to come together as a team and try and get what the gaffer wants, try to get the spark and try to win games more comfortably. Liverpool have three victories in their last nine matches in all competitions - Red Star and Cardiff at home and Huddersfield away - and while not playing well was acceptable when they were winning, it takes on a different complexion after results like that in Belgrade. Klopp thinks they need to rediscover the form which made them such a formidable proposition last season, blowing away sides with their intensity and and firepower. 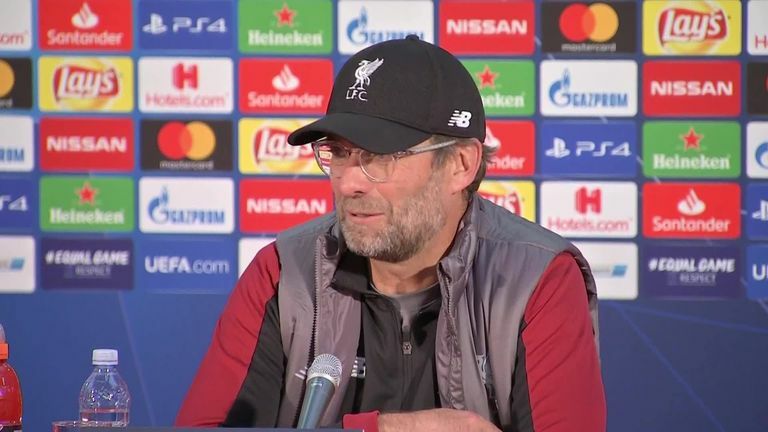 Robertson accepts they have not been at their best over the last three months and that the high standard they set in the previous campaign is now what they will be judged on. "I think it's one of those periods we need to get through," said the Scotland captain. "Last season everyone was used to us scoring four or five goals. That can't be possible every single game. "At times we've dug out results, in the Premier League more so this season. "Maybe it's not been as good to look at but we've been effective at it but, yeah, maybe we are missing a bit of a spark in terms of not winning four or five-nil in most games. "We need to come together as a team and try and get what the gaffer wants, try to get the spark and try to win games more comfortably. "The lads are disappointed. There's no hiding that. You don't forget about these results quickly and that's what happens. "We'll definitely have a debrief and I'm sure a few things will be said."